Sometimes plans come together after 200 years and this is the case with the belief that New York State believes in the Erie Canal promise of prosperity. Nothing less than 200 years ago in 1817, construction started on the Erie Canal and the hope was that it would bring business to upstate New York. 363-mile-long, the Erie Canal was used to ship millions of tons of commercial cargo every year, cutting the distance and therefore cost of shipping from the Midwest. But the growth of the railways overshadowed this and became the more favored way to ship goods. Yes, the canal has served great purpose for two centuries. In May, one website reported that Genesee Brewing shipped oversized fermentation tanks, too big for trains, on the canal. The site also reports that the canal has been used for military equipment, turbines and other objects too large to be moved by road or rail. A few months ago, we wrote about the Empire State Trail, a New York State initiative, where the Erie Canal plays a major role. Each year, approximately 1.5 million people use the Erie Canalway Trail along the historic Erie Canal, resulting in an estimated $253 million in economic activity from visitor spending. The Buffalo-Pendleton segment is the most heavily used part of the Canalway Trail with approximately 350,000 annual users. With this proposal, remaining gaps will be completed, connecting the two trails (the other being The Hudson River Valley Greenway), to establish the New York’s Empire State Trail. In 2017, the bicentennial celebration of the Erie Canal is afoot. It will begin this weekend in communities along the canal — communities that have enormous potential to capitalize on the canal for economic gain. Through efforts to expand shipping and tourism in the communities surrounding the canal, it can not only help upstate New York make an economic comeback, but also make a comeback of its own. It is reported that upstate New York economy is sluggish. The state has one of the slowest-growing economies in the country, according to the Bureau of Economic Analysis. The Erie Canal will not solve this problem but it is poised to drive growth through commercial shipping and tourism. 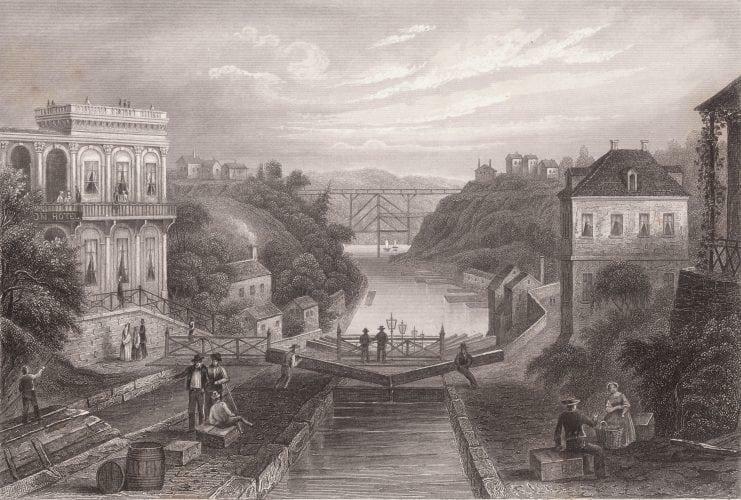 Lockport, a town located near the Niagara Falls has benefited from canal tourism, due to the Erie Canal’s locks. Part of the original Erie Canal runs straight through Lockport, and the local government is using the canal to drive tourism business for people to use boats to navigate the waters. 200 years old, the Erie canal seems to hold potential for the future. First proposed in the 1780s, then re-proposed in 1807, a survey was authorized, funded, and executed in 1808. Proponents of the project gradually wore down opponents; its construction began in 1817. The canal has 35 numbered locks, plus the Federal Black Rock Lock,and an elevation differential of about 565 feet (172 m). It opened on October 26, 1825. In a time when bulk goods were limited to pack animals (an eighth-ton [250 pounds (113 kg)] maximum, and there were no railways, water was the most cost-effective way to ship bulk goods. The canal, denigrated by its political opponents as "Clinton's Folly" or "Clinton's Big Ditch" was the first transportation system between the eastern seaboard (New York City) and the western interior (Great Lakes) of the United States that did not require portage. It was faster than carts pulled by draft animals, and cut transport costs by about 95%. The canal fostered a population surge in western New York and opened regions farther west to settlement. It was enlarged between 1834 and 1862. The canal's peak year was 1855, when 33,000 commercial shipments took place. In 1918, the western part of the canal was enlarged to become part of the New York State Barge Canal, which ran parallel to the eastern half of the Erie Canal, and extended to the Hudson River.